Welcome to Grand Hotel Gardone Riviera. The first big hotel on Lake Garda, situated in Gardone Riviera, tells the elegance and the style of all an era and mantains its charm thanks to the loving care that our family and all our staff reserve it every day. The atmosphere of the Grand Hotel Gardone will give you the magical feeling of a journey back to the past. Important people like Winston Churchill, Gabriele D' Annunzio, Paul Heyse and Vladimir Nabokov have chosen the Grand Hotel Gardone as their favorite place of resort. The view of the lake is majestic, refined and very picturesque, and becomes even more glorified with the ever changing light, sun and shades during the day and night. Grand Hotel Gardone has 167 bedrooms and Junior Suites with balcony, offering every comfort with a splendid view of the lake. The junior suite is a wide room, with a large bedroom, a comfortable sitting area and balcony with wonderful view of the lake. All the rooms are available either with double or twinbeds, they have been refurbished to a very high standard and are equipped with safe, minibar, sat TV, phone and air-conditioning, and have a spacious marble bathroom with bath, washbasin and complimentary toiletries, cotton towels, bathrobes and slippers. Breakfast is served with different emotions every morning of your stay. Enjoy breakfast on the lakeshore is really the best way to start the day, this enchanted view will be the frame of your awakening. In the morning we can also eat something sweet... tastefully prepared by our pastry chef. If you love homemade bread, in the bread corner you can taste the different flours and combinations. On the rich buffet is also fresh fruit, yoghurt, muesli and cereals, for a balanced diet rich in fiber. The cuisine of Grand Hotel Gardone offers dishes of fine cuisine, attentive to the excellence of the local products and based on the tradition of the typical taste of the lake and offers the best dishes of the Italian and international tradition and a selected wine list offers over 100 labels of the local and national area. It can be enjoyed at the pool snack bar, the lakeside Veranda restaurant or a candlelight dinner à la carte on the big terrace. Winnie's Piano Bar offers the opportunity for a drink and dance after dinner, where you can enjoy a relaxing evenings with live music. Open all day, it offers your favorite drinks and a small carte in refined and comfortable surroundings. Every evening from 21.30, except Wednesday, you can enjoy the music of various artists. The heated pool, whirlpool with relax area, sauna, turkish bath and massage area are the places of harmony and wellbeing, where you can regenerate yourself and take care of body and soul. Close to the pool you can find a sun lounge on the lakeside with sunbeds and umbrellas for the guests. Private jetty for boats and access to the lake. The pool attendant is at your disposal with matrasses and towels. Internet point and Wi-fi in all the public rooms. Grand Hotel Gardone is also the perfect location for conferences, seminars and meetings. It is an ideal place to combine work and leisure. Our conference rooms are all with lake view, natural light and are equipped with facilities for the constant exchange of air. 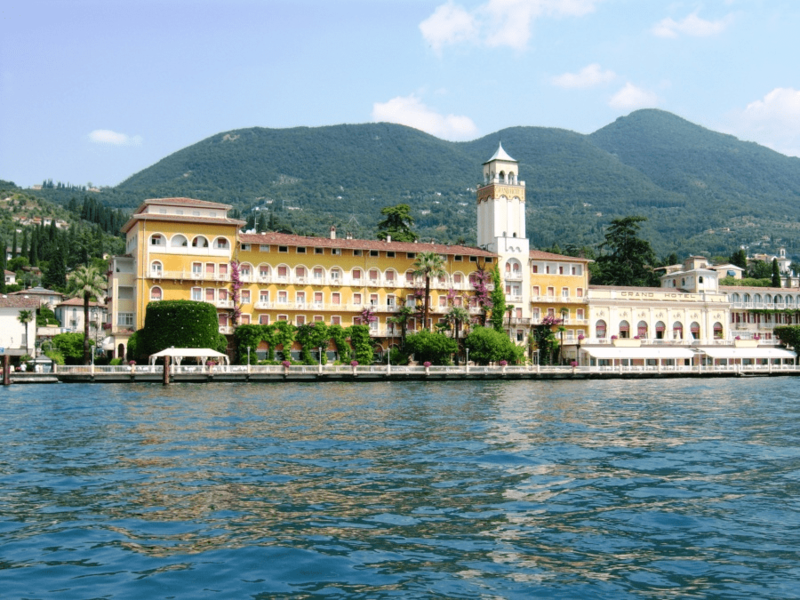 (Grand Hotel Gardone, Gardone Riviera hotels).